Karnataka Election Results 2018: JDS chief HD Kumaraswamy is contesting from Ramanagara and Channapatna constituencies. 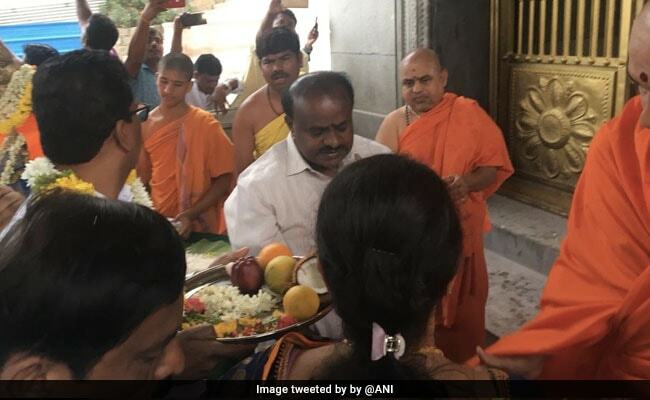 Karnataka election 2018 results: HD Kumaraswamy offers puja at a math in Mandya. HD Kumaraswamy, the man who said he wants to be "king" and not a "king-maker", headed for the Adichunchanagiri Mahasamsthana Math this morning before the counting of votes for the Karnataka assembly elections started. The math located in Mandya district, which claims to have a 2000-year history, is seen as the spiritual headquarters of the Vokkaliga community, to which the Janata Dal Secular leader belongs. 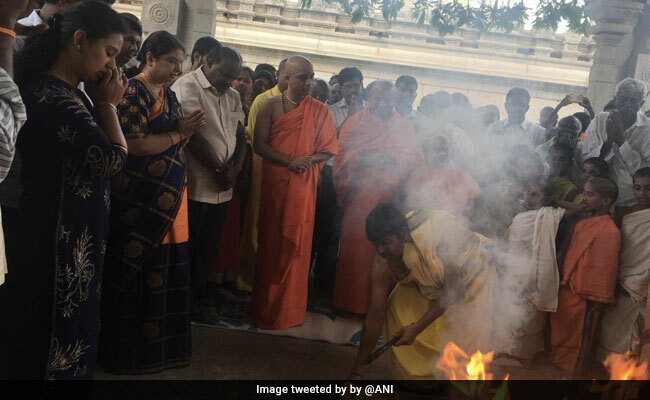 The 58-year-old leader, who is contesting from Ramanagara and Channapatna constituencies, was seen attending the morning havan (offerings to fire) and seeking blessings of the priests. He is leading from both constituencies. Mr Kumaraswamy has made it clear that he is in the race for Chief Ministership, with claims that his party will win full majority. But after exit polls predicted a hung house, where his party will play a crucial role in forming the next government, there is speculation that the JDS will angle for a deputy chief minister's post for him in return for its support. HD Kumaraswamy is contesting from Ramanagara and Channapatna constituencies. The party the JD(S) is seen as comfortable with is the Congress. Mr Kumaraswamy's father, former Prime Minster HD Deve Gowda has not ruled it out as stringently as he did the BJP. The party's senior leaders have even indicated that the overture must come from the Congress. The Congress is seen as trying to clear a path to a tie-up, in view of Mr Siddaramaiah's comment that he was open to stepping aside for a Dalit chief minister if the party leadership wants. Mr Siddaramaiah had parted company with the JD(S) and joined the Congress after a disagreement with Mr Deve Gowda over Mr Kuymaraswamy's elevation in the party. It is common knowledge that Mr Deve Gowda is yet to forgive him for that. After Saturday's election, Mr Kumaraswamy went for a quick trip to Singapore - triggering speculation that he was conducting negotiations in view of a split verdict.